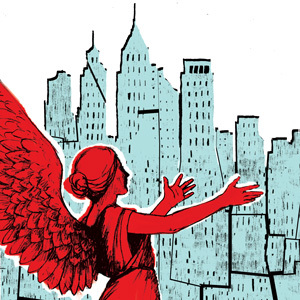 Promotional artwork for Court Theatre's "Angels in America"
Last year proved phenomenal for Chicago theater, with many outstanding productions capturing our hearts and minds (read my roundup of the best of 2011 Chicago theater on my blog), and 2012 promises to be no different. Perhaps you’ve made a resolution to see more theatre in the new year? (And if you haven’t made this resolution, maybe you should.) To get you started, here are four shows I’m greatly anticipating in the first few months of 2012. While it’s a bit of a drive from Chicago, Drury Lane Oakbrook’s exceedingly high-quality productions (and affordable tickets) are well worth the trek. So, it’s a no-brainer that I’ll be heading over that way to catch their production of this classic American musical — one of my absolute favorites. New York actress Klea Blackhurst stars as Mama Rose, and her big voice will certainly do the Jule Styne/Stephen Sondheim score proud. Finally, probably one of the most anticipated theatre events of 2012 is Court Theatre’s production of Tony Kushner’s 1993 Pulitzer-Prize-winning play, directed by Charles Newell. Kushner’s epic play, in two parts, is sure to be a hot-ticket. And the cast is outstanding: Eddie Bennett (Louis Ironson), Mary Beth Fisher (Angel), Heidi Kettenring (Harper Pitt), Rob Lindley (Prior Walter), Geoff Packard (Joseph Porter Pitt), Michael Pogue (Belize), Hollis Resnik (Hannah Pitt) and Larry Yando (Roy Cohn). This entry was posted in Arts/Culture/Entertainment, Theater and tagged chicago, Chicago theatre, Court Theatre, Drury Lane Oakbrook, Goodman Theatre, theater, theatre, TimeLine Theatre. Bookmark the permalink.